Ume Hussain is an interdisciplinary artist currently based in Abu Dhabi, UAE. She received her MFA from Maryland Institute College of Art. Through her interest in subtlety, she explores the paradoxical balance of an internal and external existence. Past work has included themes of stillness, security, contingency and the illusion of control. 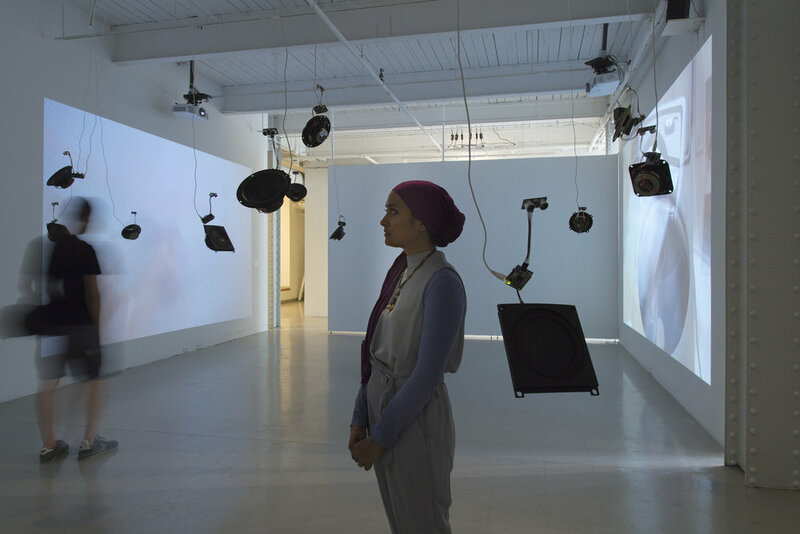 Her work incorporates video, sound, light and interactive media to engage and at times implicate her audience. Subtle, incremental change is movement. It is life. Almost imperceptible, it is a universal phenomenon we are accustomed to tuning out. Being attuned to it requires one to pause, notice and reflect. Often, it takes a disruption, glitch or malfunction to draw our attention to it. This movement can be best described as the constant adjustment to commonplace sensory experiences—sights, sounds, smells. In a larger context, it is the constant reframing and negotiation that allows us to create an identity and relationship with the world around us. My work explores the oscillation between the internal and external state of ‘being’, both of which are in a constant state of flux. How one manages to reconcile a tangible, outward identity with the ever changing facade of an internal, intangible landscape. By combining video, sound, installation and interactive media, I create situations that challenge perceptual thresholds within everyday existence.